One of our cats, Mario, has taken to scratching our fabric furniture and over the last four years our couch and love seat have taken a serious beating, along with several other pieces. We have tried it all. We did the noisemakers when we catch him scratching, we tried trimming his nails (at great personal damage - he's not a fan), we tried the nasty tasting sprays (if like me you've done this, you will come to regret it during this project), we did the double stick tape, we let him go outside, and we have three (3) scratching posts - which he does use, but we've also caught him laying on the scratching post while clawing the couch. If it weren't for the fact that my son sleeps with that cat and looks for him to cuddle the moment he gets home from school, that adorable cat might be gone. He also pees on the floors, but that's another story. As it is, since Mario the cat is only 4, I covered the damage with packing tape figuring it looked a little classier than duct tape and counted it as a lost cause... until recently. Last weekend we hosted an open house to celebrate my 40th birthday and the completion of our kitchen remodel. 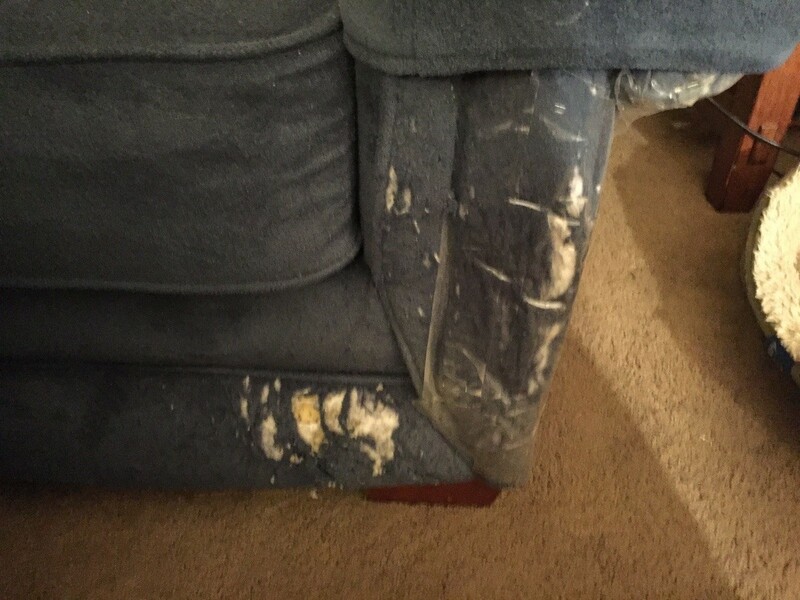 I'd invited a lot of people that had never been to my house before and decided it was time to do something about our hideous couches. Replacing them was not an option - especially after the remodel costs. NOTE: This takes a long time. I strongly recommend picking a series to watch on Netflix while you work. I ended up working on this until 5:30 in the morning two nights in a row since the party was in a couple days. I am a master procrastinator. Pick a fabric. You can do a contrasting fabric if you wish, but I wanted something that looked like "new". 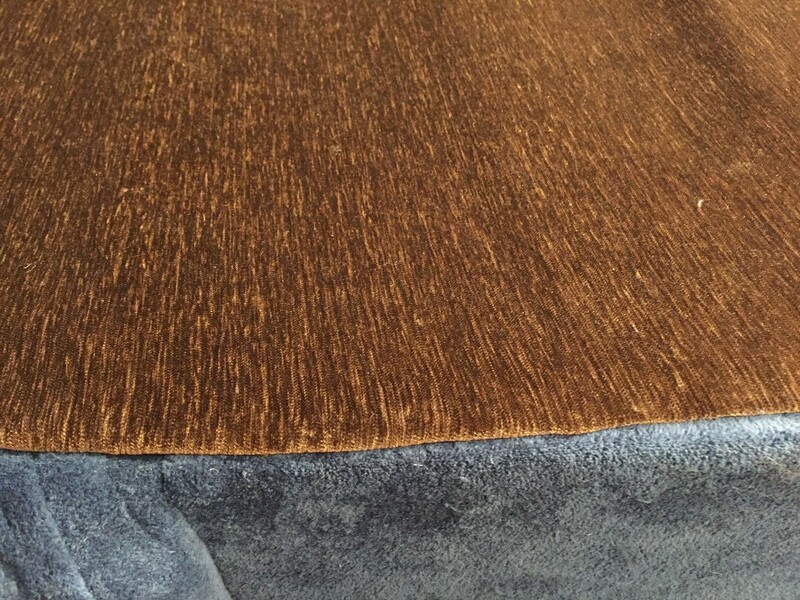 I couldn't find matching fabric, but I found about a yard and a half of a similar material in a different color in the clearance section. 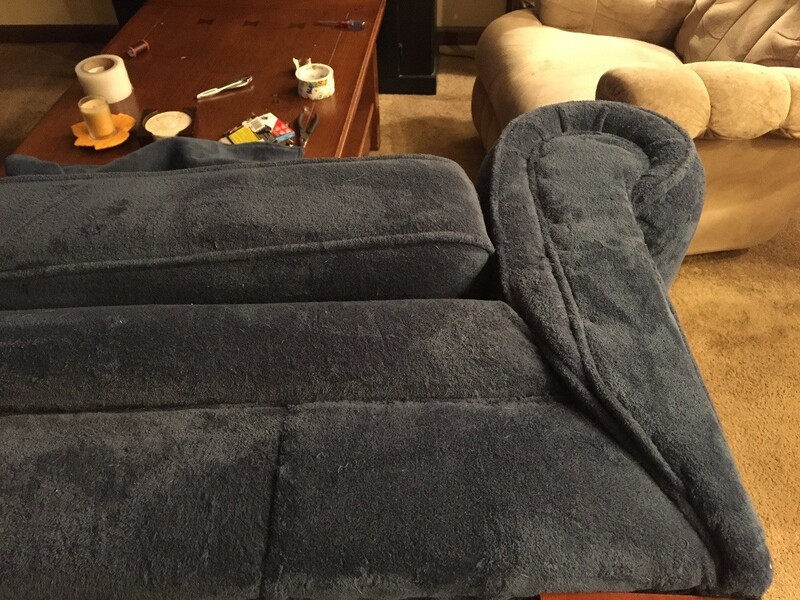 Since my love seat is against the wall, I decided to use the fabric on the back of it to fix the damaged areas, and put the new fabric I'd purchased on clearance on the back where no one would see it. 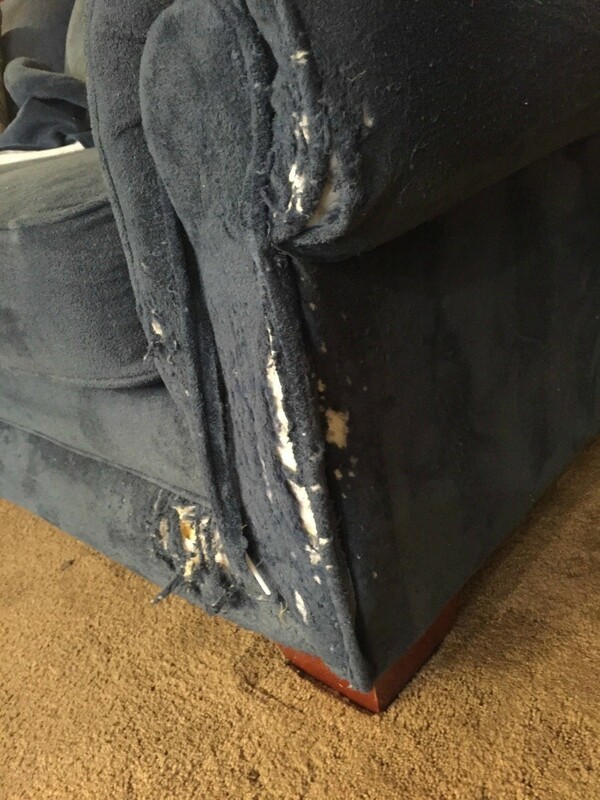 Remove any temporary covering from damaged area. Survey the damage. 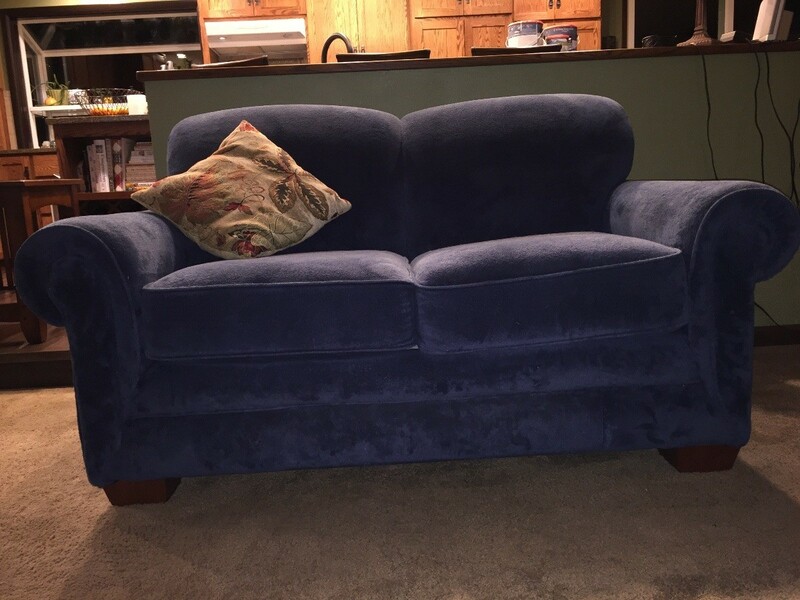 Tip couch on it's front. 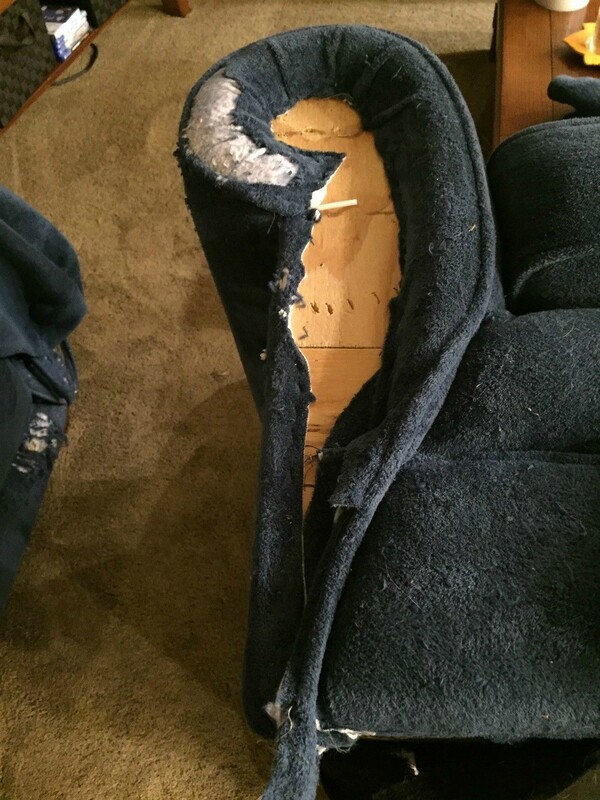 Remove legs from couch as needed. 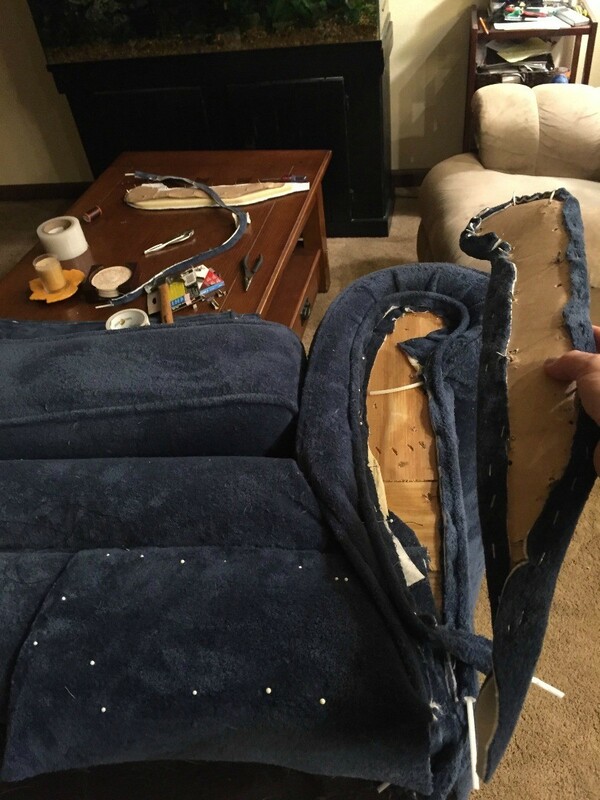 Since I decided to use the upholstery fabric on the back of the couch for this project, I removed all the old staples and tack bars from the back of the love seat to free the fabric. 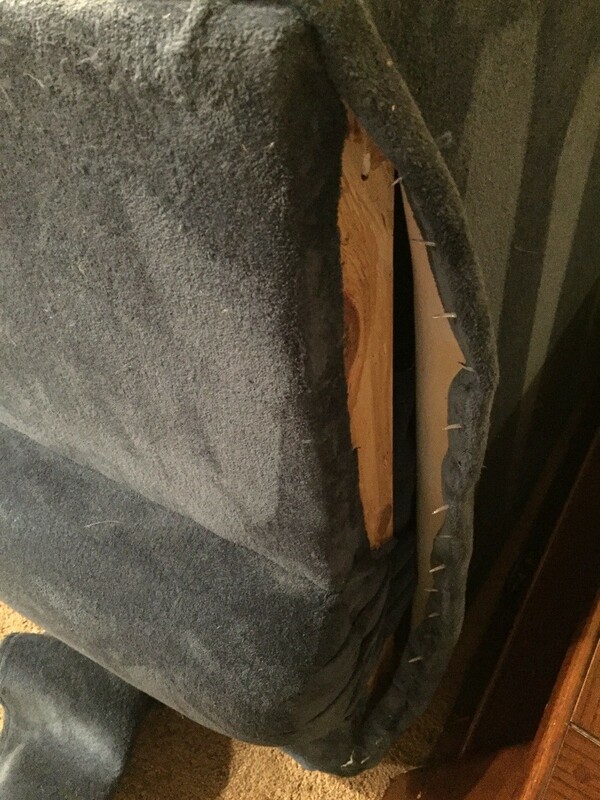 I also had to remove the fabric from the bottom of the couch along the back. 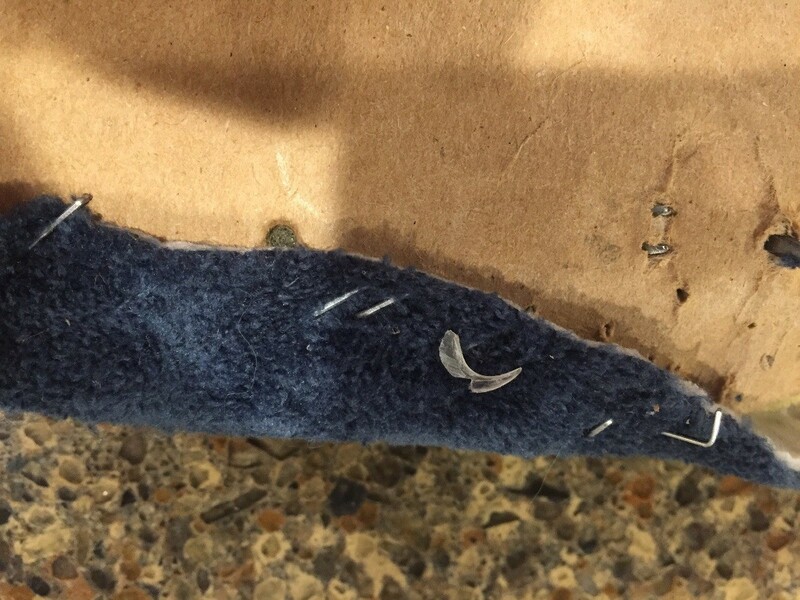 The staples were pretty well embedded into the wooden frame. 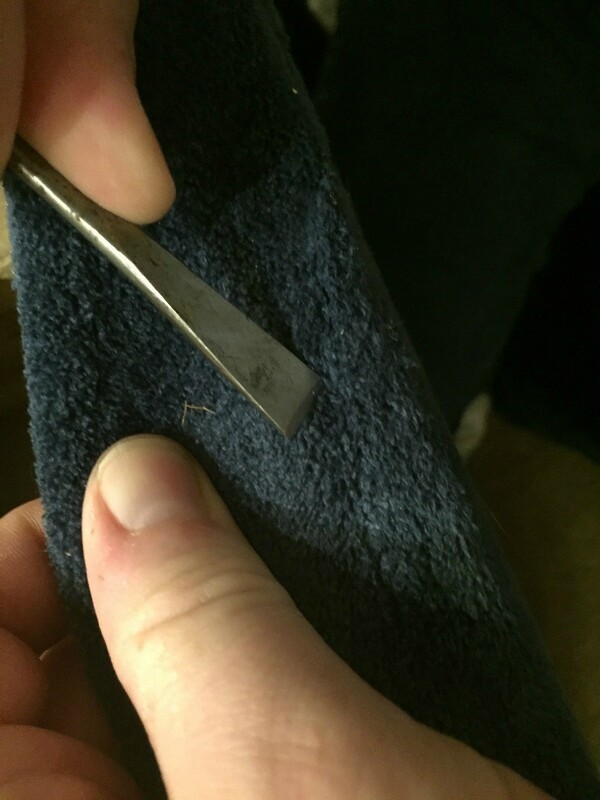 We found a chisel and needle nose pliers worked best. A flathead screwdriver should do the trick if a chisel is not available. Save the tack bars so you can reuse them. 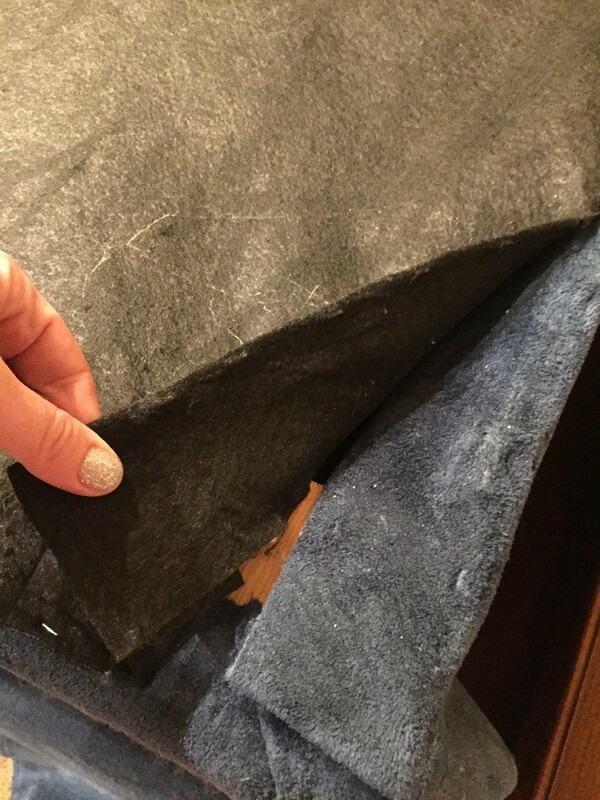 Use the fabric you removed as a template to cut the new fabric (it is likely your pets will decide to help with this). I simply pinned the old on top of the new and cut around it. Staple the new fabric back on. 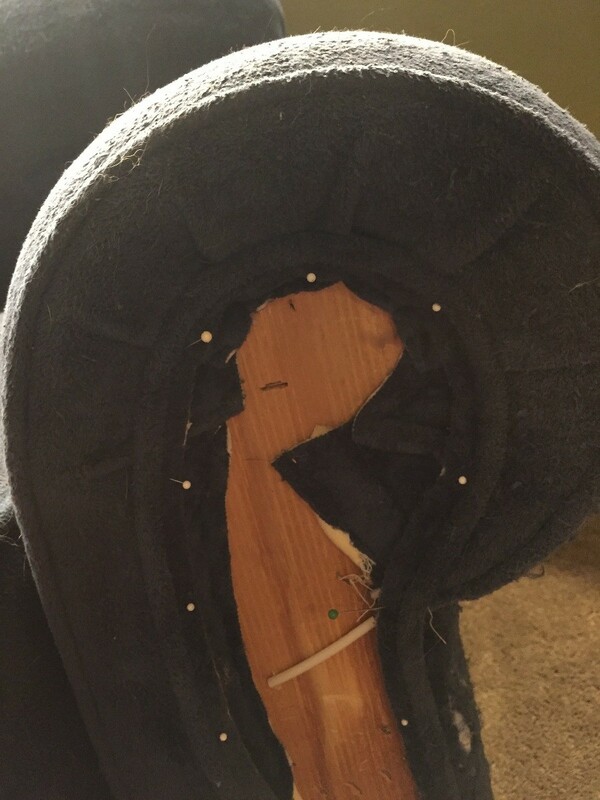 My original plan was to reuse the tack bars and hammer them back in. This met with limited success on the second side as they had lost some of their shape during the removal process. 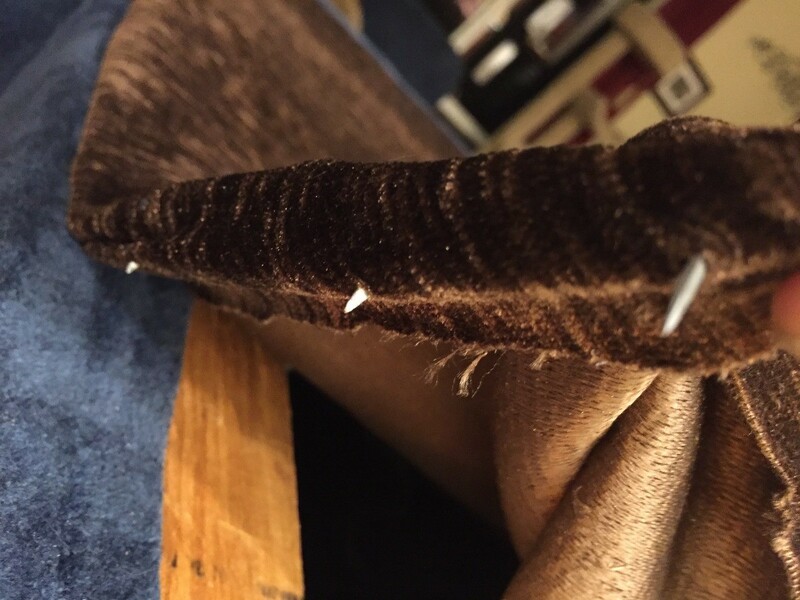 Since I was under a deadline and no one was going to see the back of the couch anyway, I finally gave up and simply stapled the new fabric on. Pound down any sharp edge that are sticking out to protect your walls. 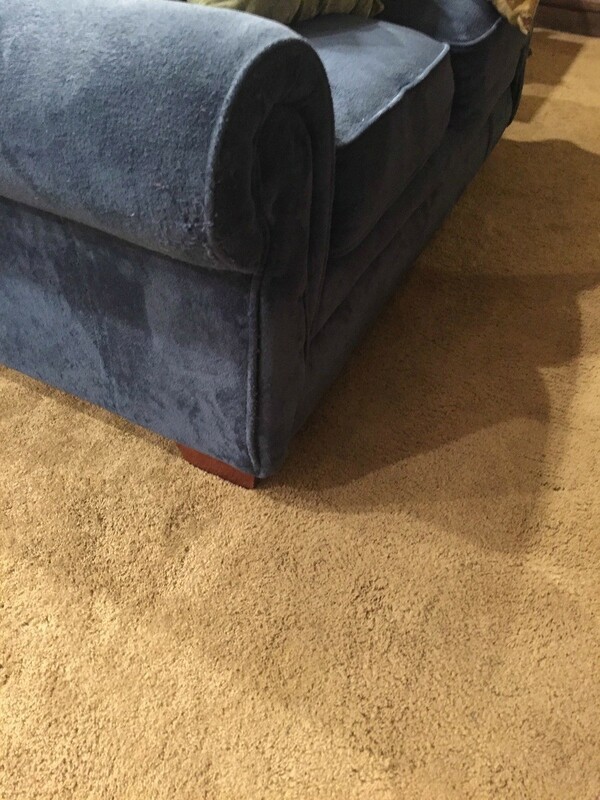 Flip the couch over so you can access the front of the couch. 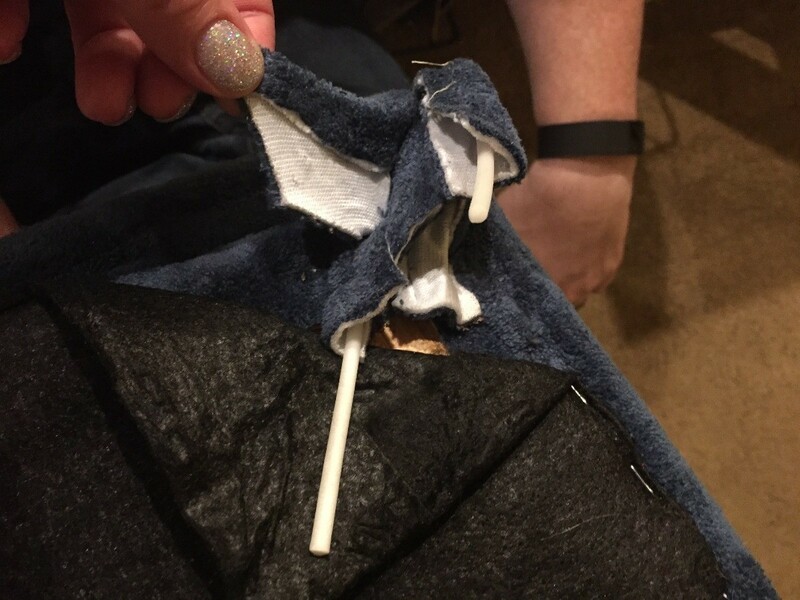 There are three types of repairs you can do: replace the fabric for an entire section, patch over a damaged section, and close a simple rip with needle and thread. Decide how you are going to address each area. 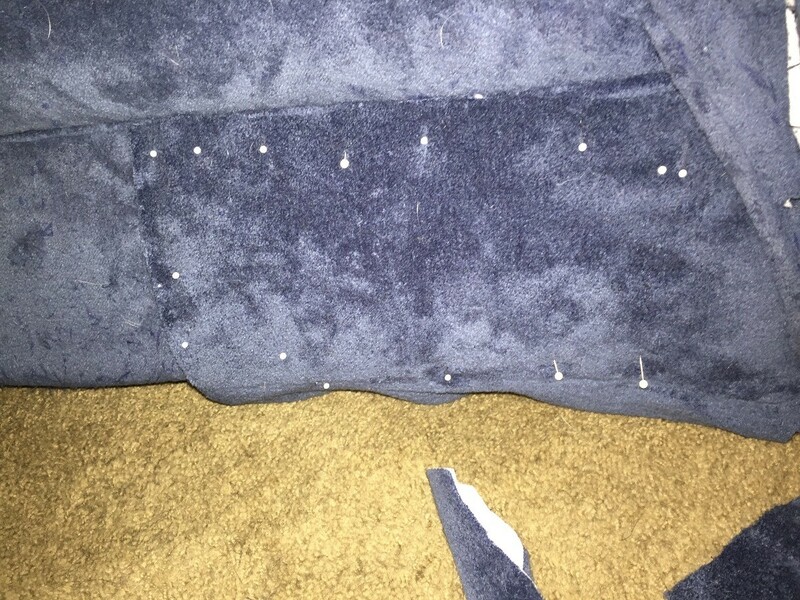 I marked any rips I planned on sewing with a pin (and here's some trace evidence of our little culprit). Take pictures of how any tricky bits are attached to make sure you can remember how to put everything back together. You will need to carefully remove any sections you wish to replace. This will typically involve removing a lot of staples. 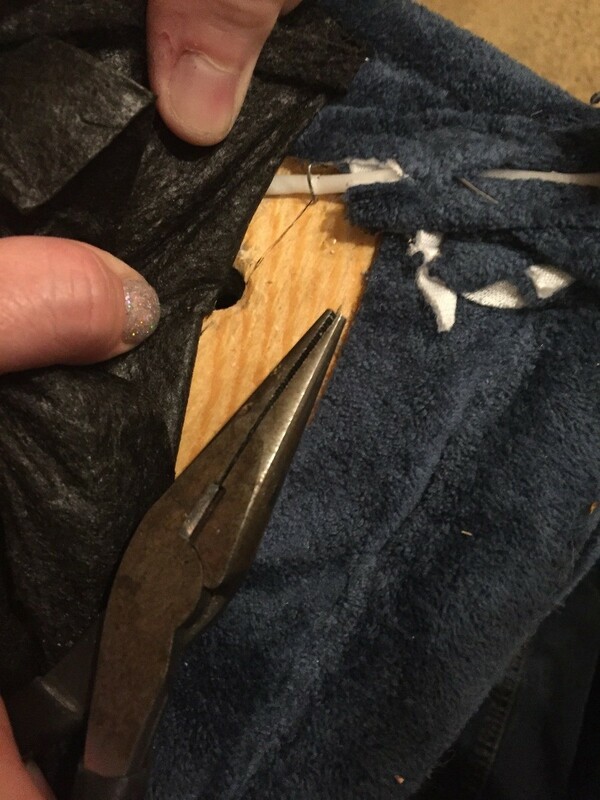 Then remove the fabric. 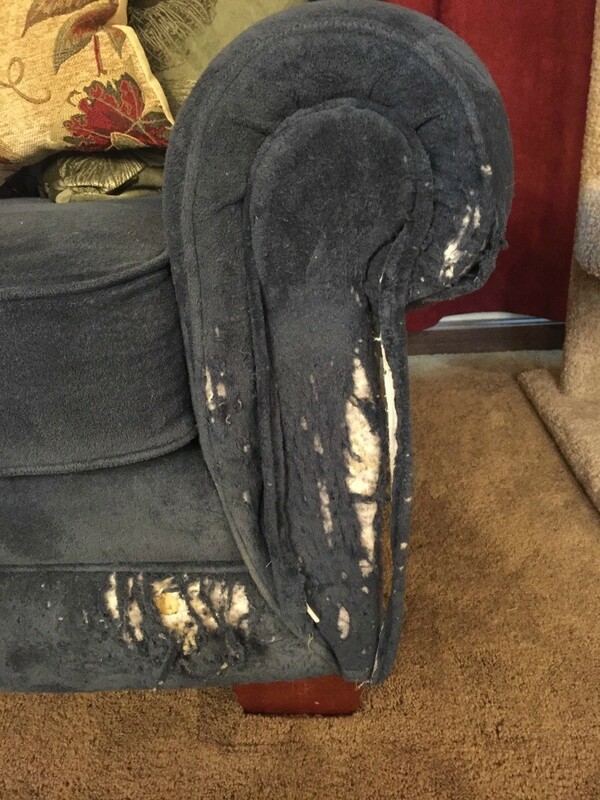 I chose only to remove the fabric from the decorative areas on the front of the arm rests as they were so badly damaged and fairly self contained. 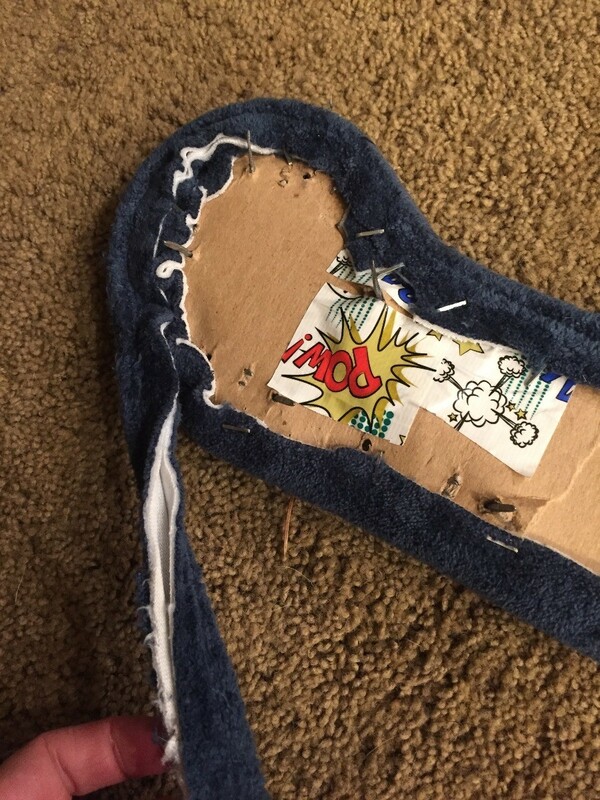 In this case the sections I wanted to replace had the fabric stapled on a cardboard template (don't worry if you damage the cardboard - duct tape will fix it). 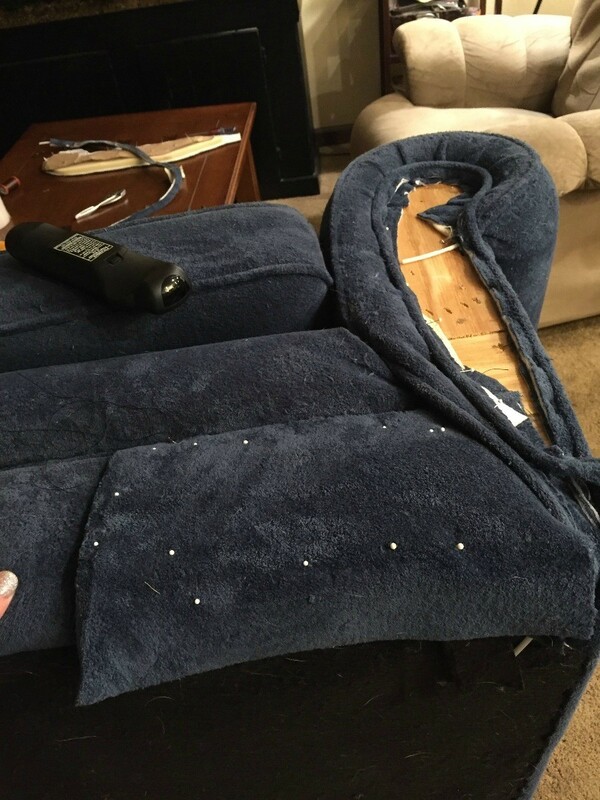 Use the fabric you removed as a template to cut a replacement from the fabric you reclaimed from the back of the couch. 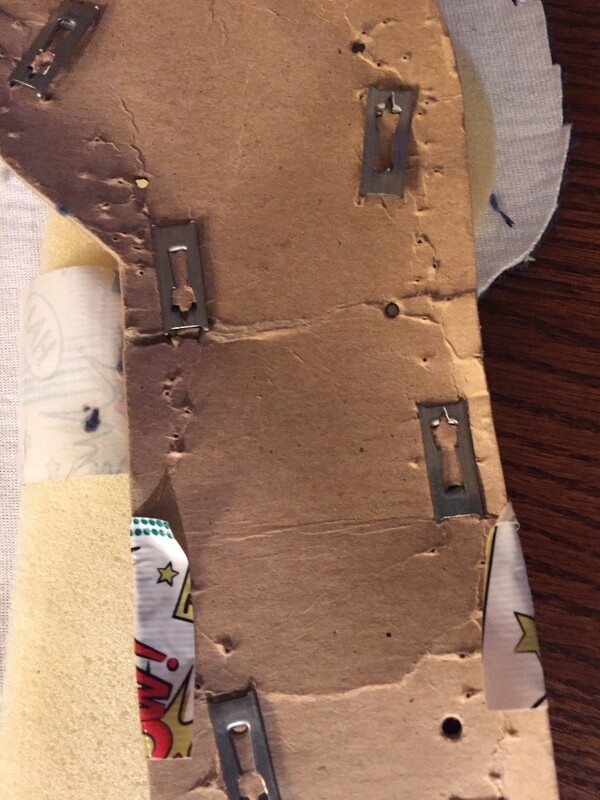 Staple the new fabric onto the cardboard. Through trial and error I found it was also easiest to staple the piping to the cardboard for the arm front. Not doing so meant I had to sew the piping into both the side arm fabric and the decorative piece. 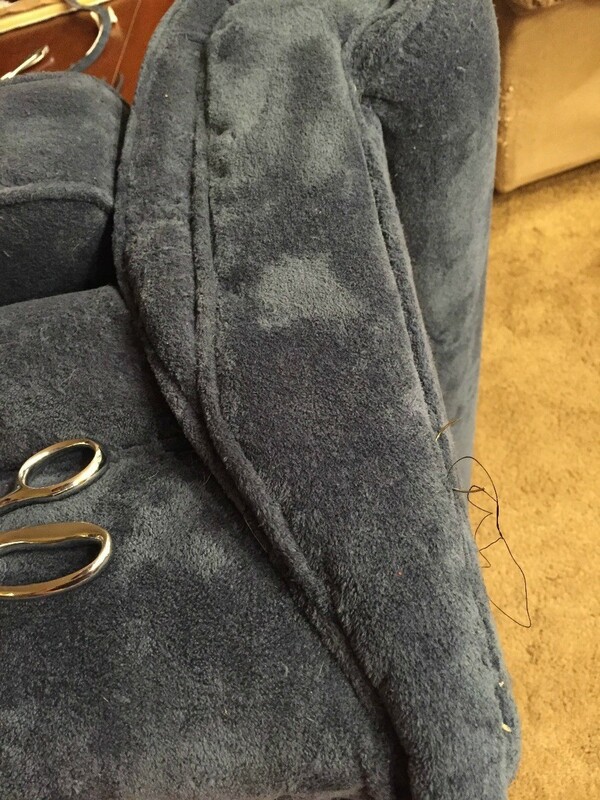 Before putting the arm rest front back on, go through and hand sew shut any little rips using the upholstery needle and thread. I found it worked best to mark all the rips I needed to address with a push pin and make my way from spot to spot. Depending on how many rips you have - an argument could be made for recovering the entire section instead. Note: The old fabric had been sprayed heavily with bitter no scratch spray several times about a year ago. 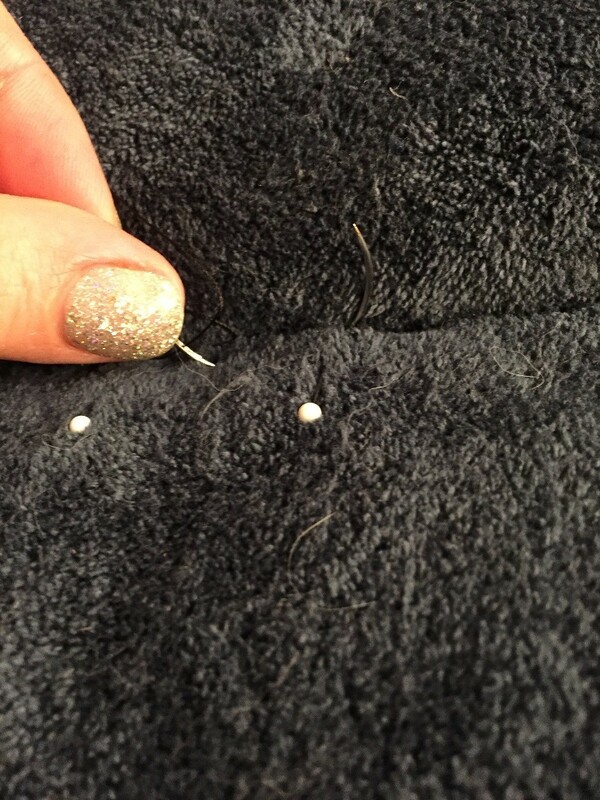 The bitter product was still in the couch and transferred from the fabric to my mouth via the thread when I would lick my fingers and run them over the thread before threading the needle. Blech! That taste would certainly have deterred me from scratching! 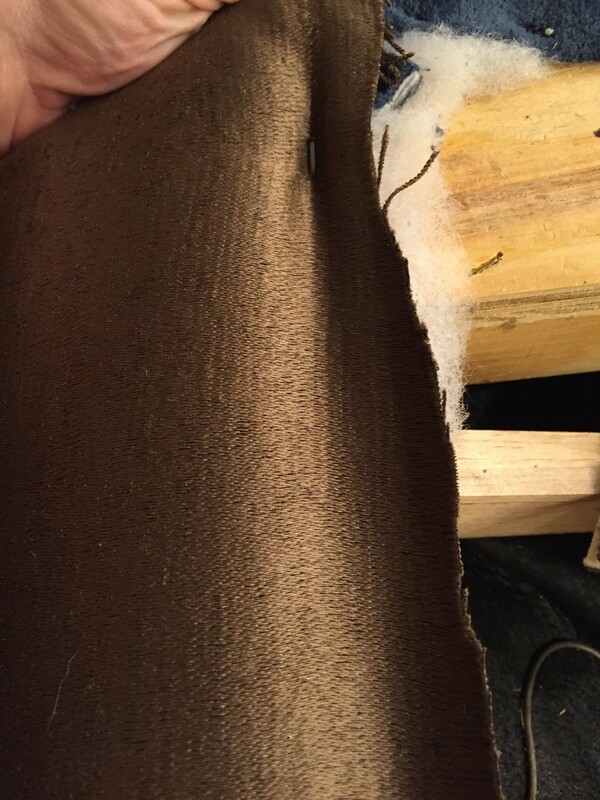 I had some long sections of fabric with damage only at the ends, that I decided to patch by sewing new fabric over the top. 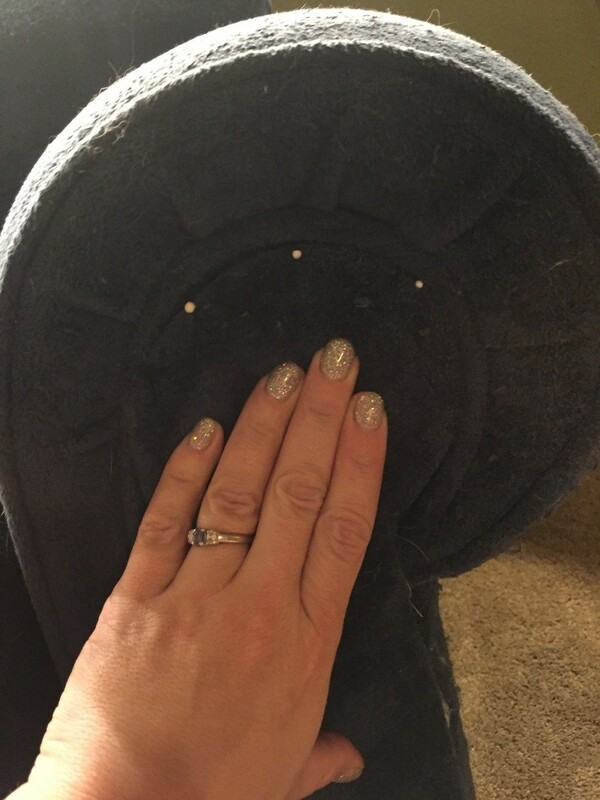 Cut an appropriately sized piece and pin it over the damaged section, to ensure you like the coverage. 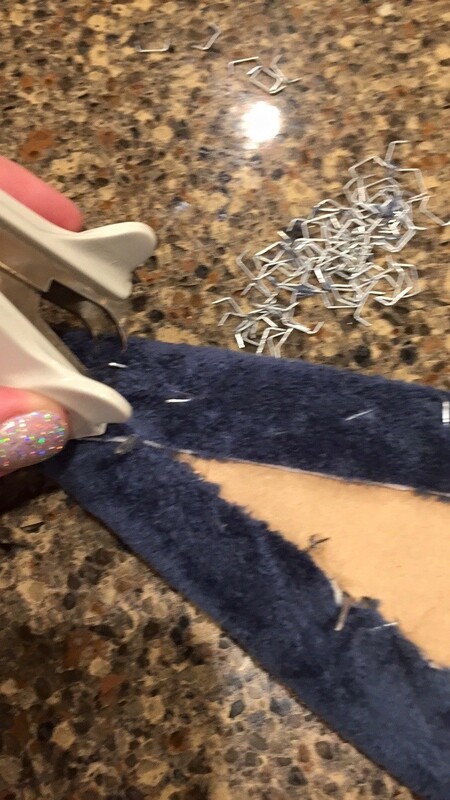 Try to get up into seams, down into the arm area, or under the bottom edge of the couch where you can staple rather than hand sew as much as possible to save time. When you are happy with the coverage, stitch the patch on. 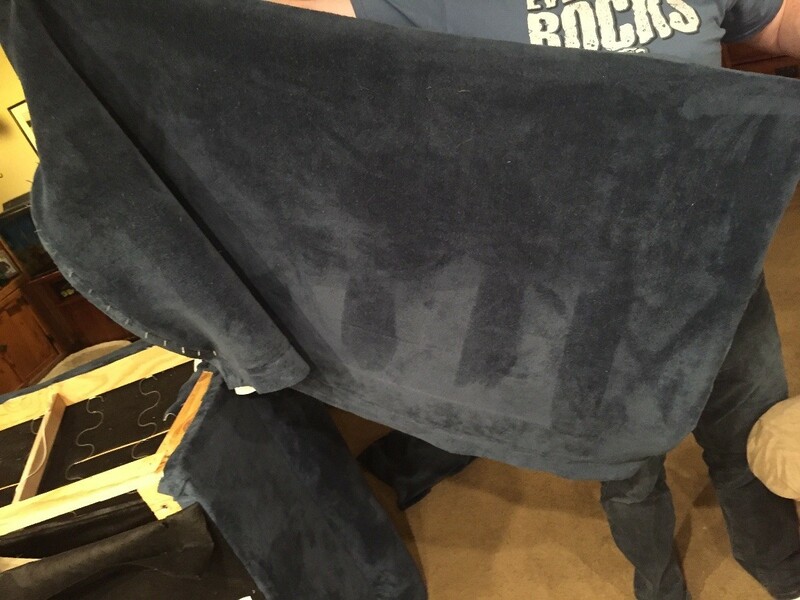 Note: I tried folding the first patch under to create a nice edge, but because my couch has a thicker fabric it ended up showing more and looking a little bulky. 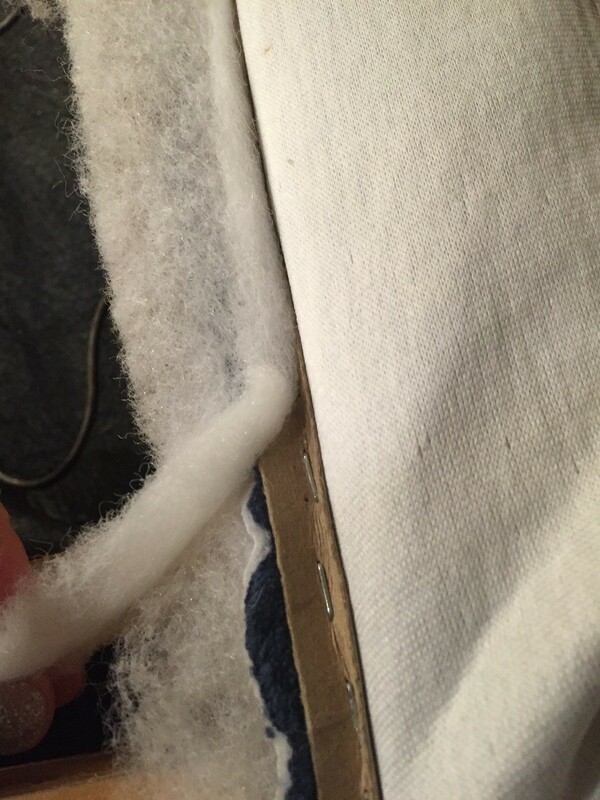 Since my fabric is a little more plush and doesn't fray, I kept the rough edge on the remaining patches. You do have to place your stitches a little closer but it is far less noticeable. 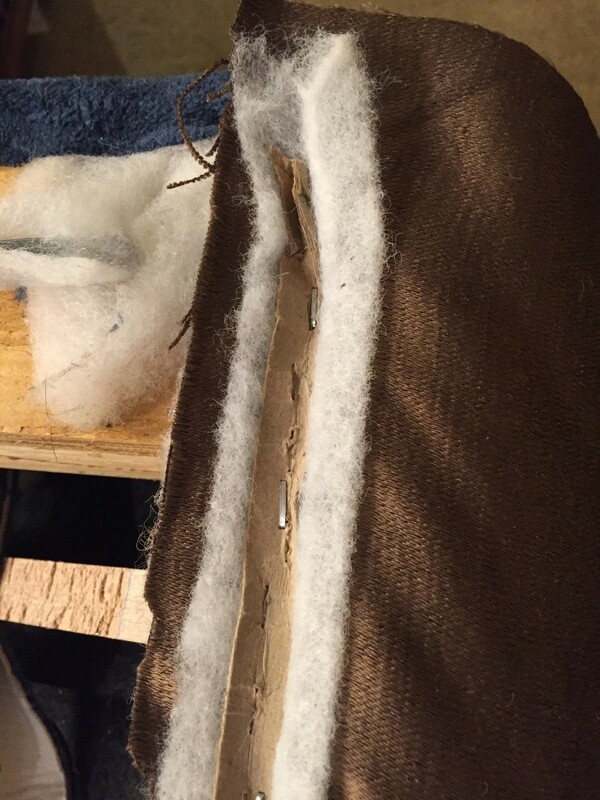 I've include pictures of the sewn under edge, vs rough edge. 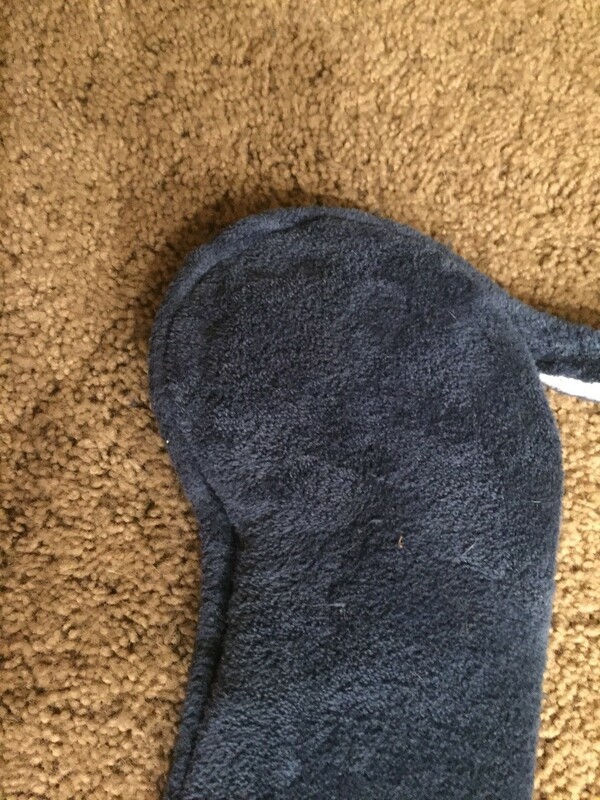 Attach the arm rest "cap". 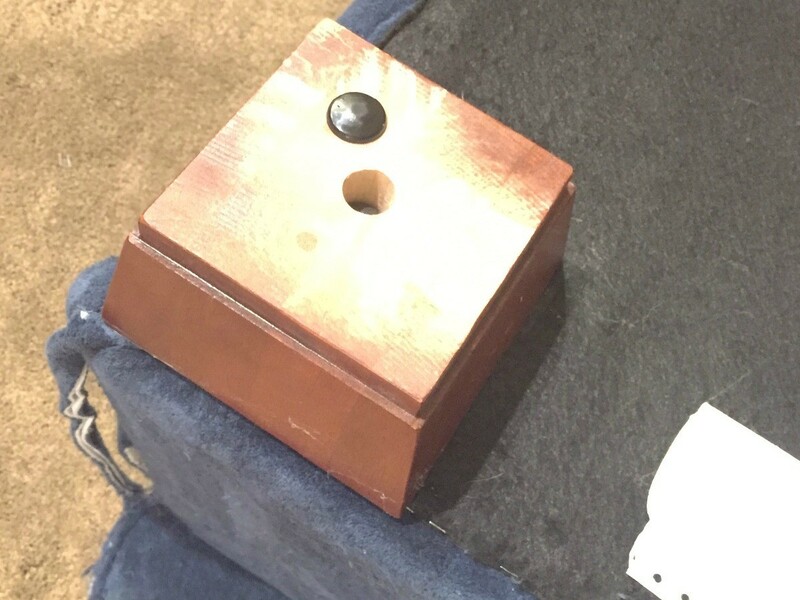 I had hoped to hammer the tacks for this piece back in, but alas, too many of the pieces had become bent during the cat scratching frenzy and my removal of the piece. 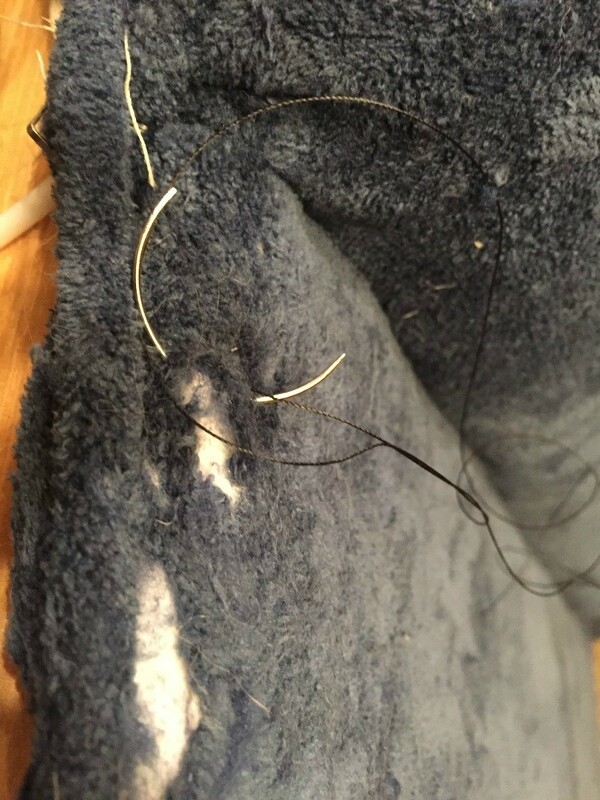 I had to hand stitch it back on. Refer to your pictures if you need a refresher on how anything was attached. Give everything a final once over to make sure you haven't missed anything big and you are done! This turned out far better than expected. My original goal was to simply have them look better than they did before. 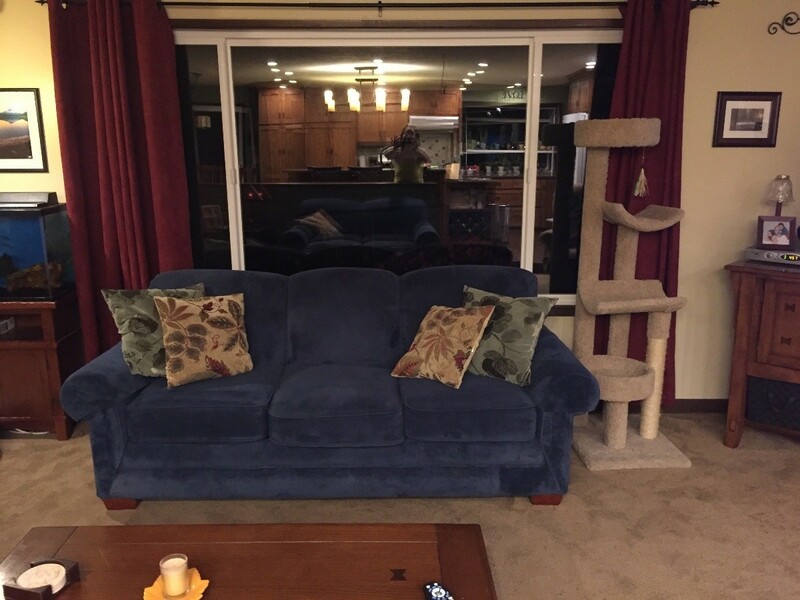 I am so pleased, my couches look almost like new and you can barely tell where my repairs were unless you look close. So... Does anyone want a pet cat? Wow that came out really good! Amazing job! Wow, good job! 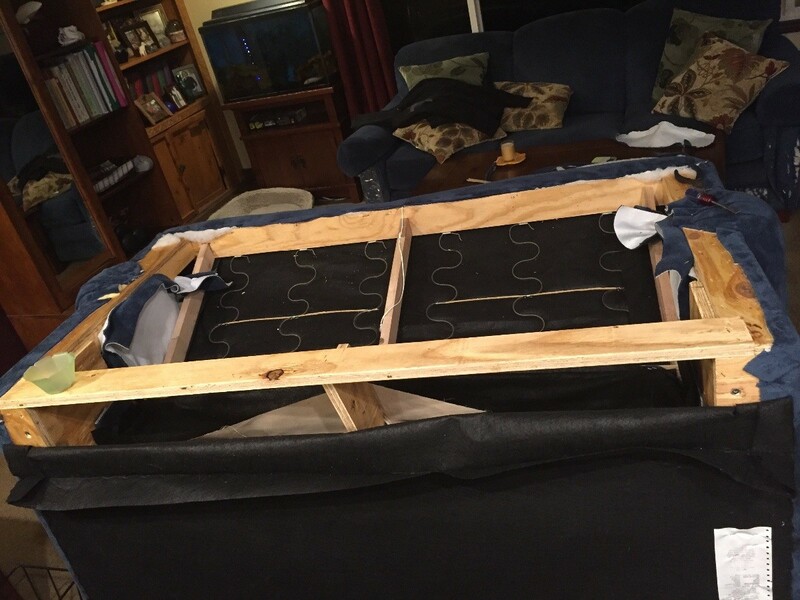 Your sofa looks awesome, and you sure saved yourself a boat-load of money! 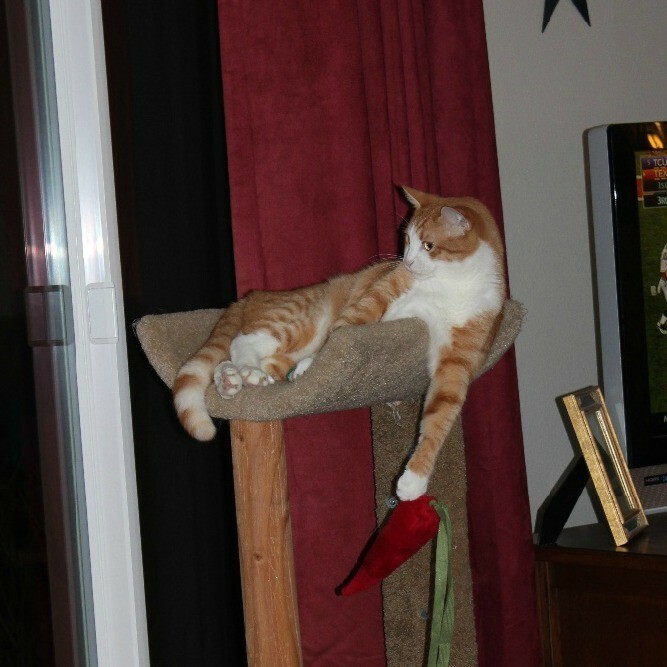 I have several pieces that are worn + cat toys. 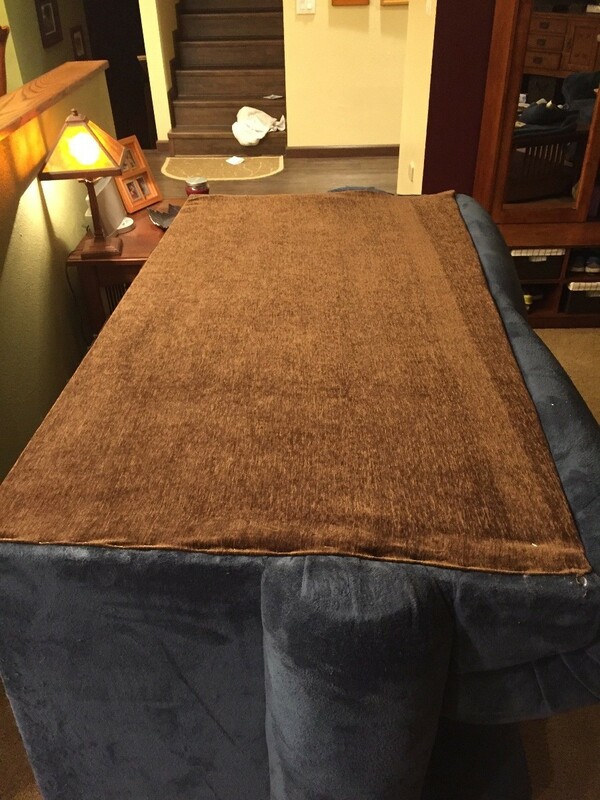 I bought a large painting tarp that I am going to attempt as a cover for a leather recliner. I have nothing to lose but $30 for the tarp and my time. You give me hope that I might be successful. 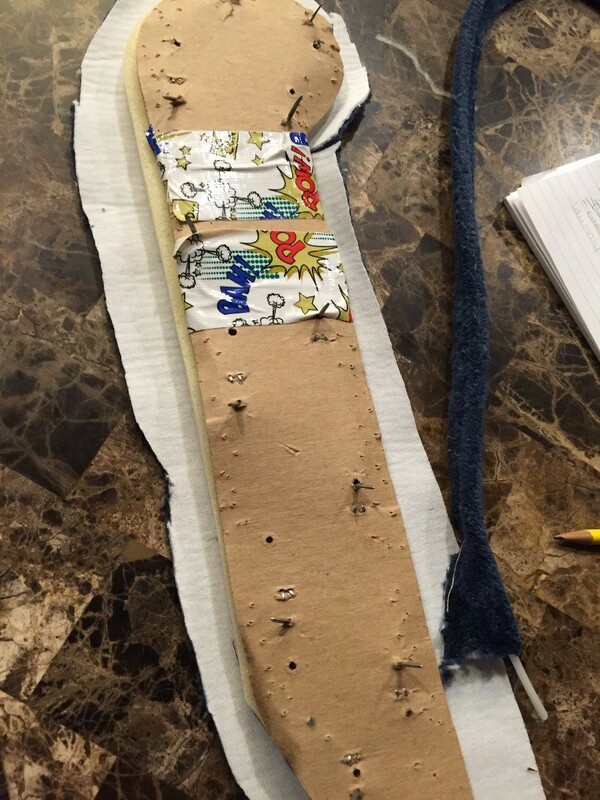 Also, you inspire me to take photos of the project and I will share if it works. Wow! You did a really great job. Congratulations. What a difference! You did a beautiful job of repairing it . I didn't read your article 'word for word', since I don't have a cat. The amount of time and work you put into this project is amazing, and the end results are fantastic! Just one question. What's to keep Mario from damaging all that beautiful work, just as he did to the original? Make that two questions. As much as cats hate water, why wouldn't a spritz from a gun or spray bottle when caught in the act, be an effective deterrent? We've tried spraying water and every anti-scratch product on the market. He did start scratching at the recovered couches. Since he was also peeing all over the house, Mario now lives in the garage/outside with a cat door in-between (he was inside/outside before). He has a scratching post, bed, and still gets lots of attention out there. The vet said there is no medical reason for him to be peeing and nothing we had tried worked (different types of litter boxes, litter, etc). I too wondered what was going to change for Mario when he started tearing up the beautiful job you did. People suggesting water sprays or loud noises to discourage Mario probably have never had a cat. Cats are smart and wait until you are not around to do what they know perfectly well that they should not be doing. 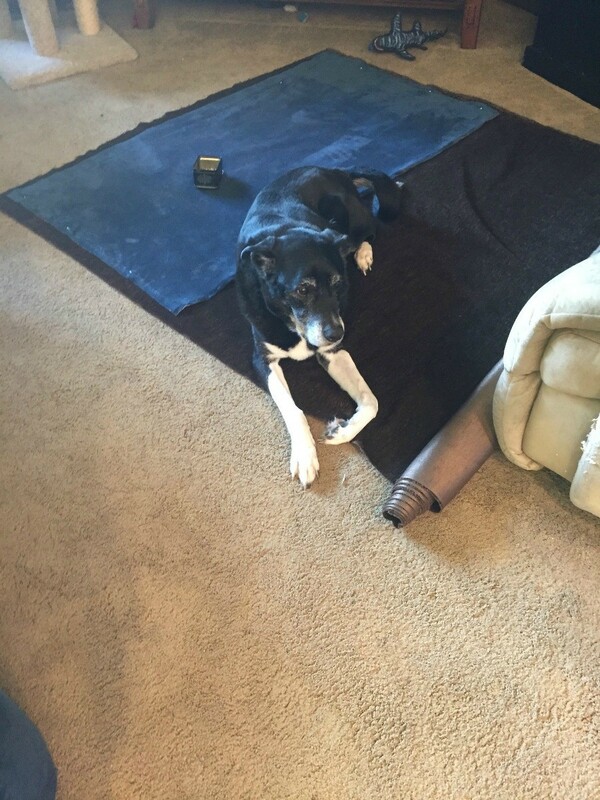 I thought maybe you could cover the couch with a sheet or drop cloth, maybe he wouldn't like that ... being sort of loose and probably not as satisfying as a scratching surface... then remove the sheet when company is coming. But your garage idea may be best. It is nice that you are keeping Mario, since your son loves him! You are a genius! Well done...brilliant...!! !